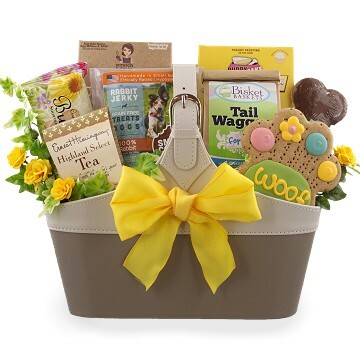 Our Dog and Owner Gift Baskets are a unique gift idea for almost any occasion; including dog lovers birthdays, dog lover thank you gifts or even a corporate gift for that special client or dog loving business associate. included with all of our Dog & Owner Gift Baskets! Forever Buddies Care PackageAn adorable pet themed mailer holds treats for both the dog and his owner and is a great way to send well wishes, celebratory wishes, thinking of you, new home and is suitable for about any occasion you can imagine. Our gifts for pets and owners are unique and our customers and recipients love them! Many Thanks Dog & Owner GiftSending a thank you gift is a wonderful way to say you’re appreciated or that your service or patronage has been noticed, but when you send a dog lover appreciation gift to a dog owner, you’ve now made a wonderful gesture to include their beloved dog as well. Our dog lover gifts are a huge hit with not only family and friends, but across the corporate industry as well as they contain treats for both the owner and the dog! Smiles and Wags Dog and Owner Gift PackageNeed to send a gift for someone who loves their dog? Send them a gift they can share! Our Smiles and Wags Dog and Owner gift package is sure to please as it comes with treats for the owner and a beautiful bakery fresh and hand decorated doggy biscuit just for Fido. Warm Wishes for Dog & OwnerSend them a gift they are certain to enjoy by including biscuits for their dog as well! These wildly popular pet lover gifts are a perfect choice for almost any gifting occasion as they include goodies and treats for both the dog and his owner. Happy Day Dog And Owner GiftCelebrate their achievements with our Happy Day Dog Gift. A delicious assortment of goodies can be found inside this bright and sunny gift for both the dog and his/her owner. It all begins with a sunshine yellow polka-dot handled tin holds this impressive assortment of goodies along with an adorable flower notepad with matching pen. Send greetings of accomplishment or encouragement with this pet lover gift as it is very versatile for any gifting occasion for her or her dog. Goodies for Dog & Owner Gift BasketWhat can be better than receiving a gift? Sharing it with your favorite canine! We designed this special pet lover gift with treats for both the family dog and for the owner as well. Fido will enjoy an assortment of yummy gourmet biscuits while the family enjoys baking the famous Cookie Kit selection from the famed show Shark Tank! Lots of yummy treats for everyone inside this pet lover gift. Pizza For Two Dog & Owner Gift BasketSimply awesome! A great family gift that is perfect for those families with a dog or two as it contains not only the makings of a great pizza dinner for the family, but treats and biscuits for the dog too. Dog lovers everywhere are certain to enjoy this perfect pet lover’s gift as you’ve thought of them and their pooch as well. Country Charm Dog & Owner GiftA sense of country charm abounds in this delightful pet lover gift. A gift that is two gifts in one, our pet lover gifts hold treats for both the dog owner and their precious canine too. A distressed wooden container holds this delightful assortment and is well suited for occasions like birthdays, get well, appreciation and job well done too and more. Uptown Dog & Owner GiftThis beautifully themed pet lover gift contains goodies for both the dog and the family! Fido is sure to enjoy the variety of gourmet biscuits while the family will enjoy the makings of one fine homemade pizza and more. Our dog lover gifts are always a hit and are enjoyed by the whole family; even Fido! Classy Dog & Owner GiftSend a classy pet lover gift that’s designed for both the dog and the owner. Tucked inside they will find tasty sweets and snacks as well as dog biscuits and goodies. This pet lover gift is perfect for just about any occasion so don’t hold back – have fun and brighten someone’s day. Biscuits & Cookies for Dog & OwnerThis bright and fun gift is designed with both the pet and his owner in mind as it is filled with goodies for both. Fido is sure to enjoy the assortment of yummy gourmet biscuit flavors and a brand new ceramic bowl while the owner enjoys the famous Cookie Kit that was shown on the TV show Shark Tank and more. A delightful assortment for both and a wonderful way to acknowledge man’s best friend for any gifting occasion. Happy Munching Dog & Owner GiftWhen sending the right gift is so important; remember they love their four legged friends and our pet lover gifts are a perfect choice. Filled with an assortment of goodies for both the dog(s) and the owner our collection of dog lover gifts meets the goal with both style and taste. Friends Forever Dog & Owner GiftWe know that a man’s best friend is his dog so why not celebrate the occasion with a gift that includes treats for both of them… all in one gift. Our Friends Forever collection is filled with an assortment of goodies that the pet owner is sure to enjoy and dogs love biscuits so we’ve made sure there are plenty inside this gift for Fido. Celebrate the occasion in style and they may just bring back the awesome handled tin for you to refill again!